The Jazz Spivs are the hottest 1920s party band on the boardwalk. They are the perfect band to recreate the glitz and glamour of the roaring twenties at your next event. 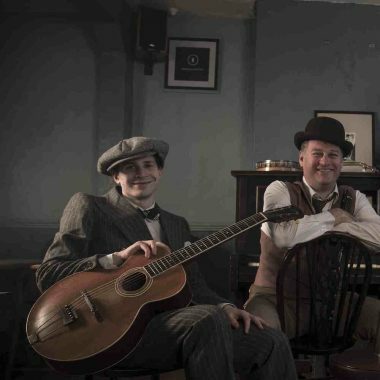 Specialising in music from the roaring twenties and recreating the glitz and glamour of the era, the Jazz Spivs are the hottest 1920’s band on the boardwalk. 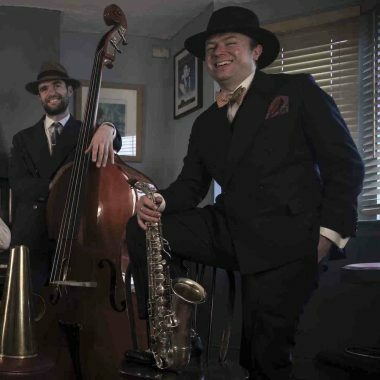 Perfect for dancing, drinking cocktails and doing that cheeky Charleston, if you want to add that authentic atmosphere to your Prohibition juice joint party, then the Jazz Spivs will give you a swell time! Each of the band members has years of experience entertaining in speakeasies. Check out the video of us in action to see for yourself. We can even bring flapper girls to your party who’ll get everyone on their dogs (feet) in no time. 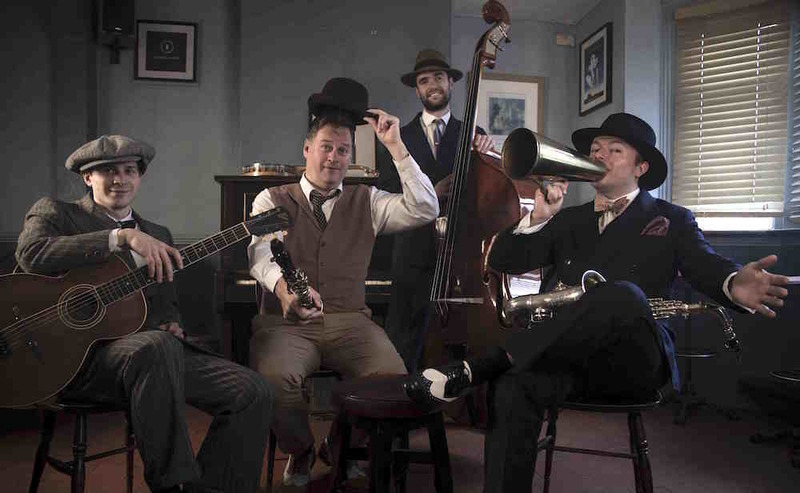 So, if you’re looking for a tip-top band for a swanky event, let the Jazz Spivs do the talking! Our musicians have performed for: British Petroleum, Cancer Research UK, Conservative Party, European Climate Exchange, Falcon-Chambers, Field of Dreams Music Concerts, Gordon Ramsay, Guildhall School of Music & Drama, Hampton Court Flower Show, Hayling Island Jazz Festival, Henley Regatta, Hodson’s Legal, ING Direct, Lord Mayor’s Show, Olympic Torch Relay, PayPoint Ltd, Royale Cuisine, Richmond Athlethic Rugby Club, Royal & Sun Alliance, St Anthony’s Hospital, Tokyo Electron Europe, Topsail, Waverley & Balmoral Excursions, Wedlake Bell, Worshipful Company of Grocers, Worshipful Company of Firefighters, Worshipful Company of Launderers, Zafferano. Our musicians have performed at venues which include: BMA House, Boodles, Buckingham Palace, Buxted Park Hotel, Claremont Landscape Gardens, Estorick Collection, ExCel Centre, Farnham Maltings, Forde Abbey, Girdlers Hall, Guildhall School of Music & Drama, Ham House, Hampton Court Flower Show, Hilton Hotel, Inner Temple, Kew Gardens, Knebworth House, Mall Galleries, Mansion House, Merchant Tailor’s Hall, Natural History Museum, New Zealand House, Nottingham University, Plaisterers Hall, Rembrandt Hotel, Richmond Athletic Rugby Ground, Royal Academy of Arts, Royal Garden Hotel, Royal Holloway, University of London, Royal Horticultural Society Gardens, Royal Society of Arts, St James’ Palace, The Conservatory, The Guiness Brewery, The Hosiptal Club, Tower of London, Waldorf Hotel, London, Warsash Maritime Centre, Wiltons Music Hall. Our musicians have performed for VIP’s which include: Her Majesty The Queen, Robert Smith (The Cure), Gordon Ramsay, Ray Winstone, Sir Ian Botham, Paul O’Grady & Cilla Black, David Hasslehoff, Eddie Izzard, Ainsley Harriott.